Jessi and Matthew, collectively known as The Flowers, are humble students of the Earth and All life. Their paths converged in 2012 and thus began a collaborative journey of healing and learning. 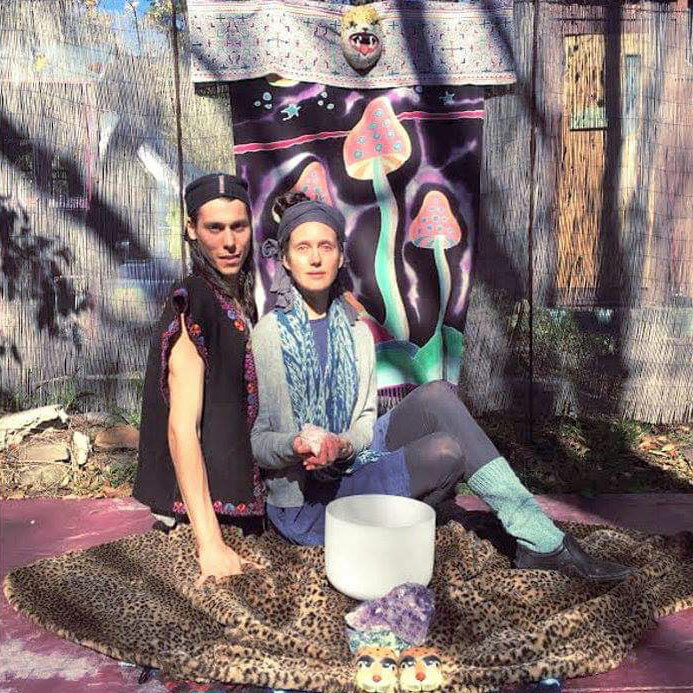 Whether practicing Permaculture, visual and fiber arts, music, herbalism, or healing work, Matthew and Jessi strive to bring more harmony and healing to the Earth and all beings. It is a tender and transformative time on Planet Earth, as the dominant culture threatens to destroy all that is sacred, our potent prayers are needed to help shape change, guide our actions and energize the restoration of balance, justice and peace for all life. Each one of us is an integral part of the One-Self and in this context we open a Gentle, Powerful, Prayerful sound container of channeled prayers, songs, and intentions to help participants navigate in the moment energies as they ebb and flow throughout their experience to step deeper into All that they are. Through quartz crystal bowl harmonics and Channeled Light Language Songs, heaven and earth are consciously bridged in a multi-dimensional, transformative, healing sacred space where all is allowed to heal.